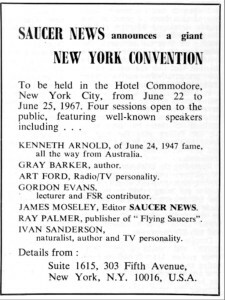 The best attended indoor UFO convention in US history took place on the weekend of June 24, 1967 in the Hotel Commodore in New York City. 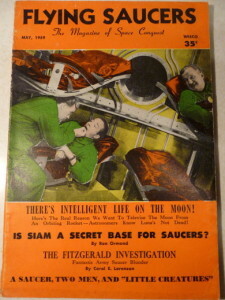 Flying saucers have always been considered a good laugh, sort of a stepchild to the entertainment business. 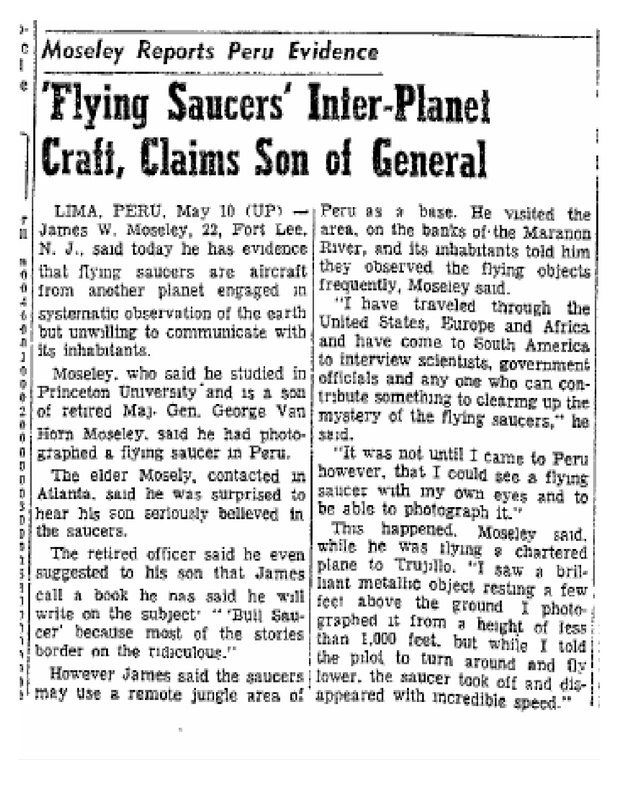 On the sober side, for some 20 years, “sightings” have been reported and evaluated by the Air Force. Last year more than 1,000 sightings were officially considered by ‘Operation Blue Book” at Wright-Patterson Air Force Base in Dayton, Ohio. Most of these reported incidents were explained convincingly to have been aircraft, satellites, weather balloons, clouds, fireworks, birds and swamp gas. “Insufficient data” is the name of the file for those sightings that remain a mystery. 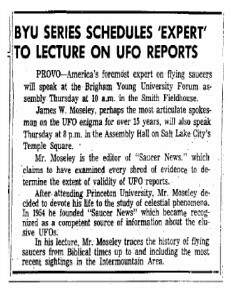 My guess is that a large segment of the public believes in flying saucers. 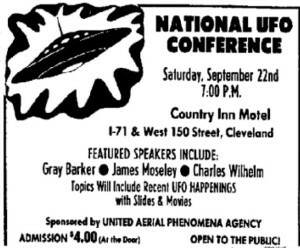 UFO — unidentified flying objects — have been seen and experienced by too many police officers, airline pilots and respected citizens. They cannot be written off as the imagination of sick people or the pranks of advanced science students They are a source of fascination and flourish in a society friendly to scientific discovery and adventure. 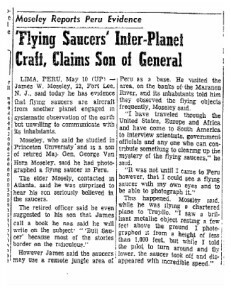 Currently, James Mosely’s Saucer News (Fort Lee. 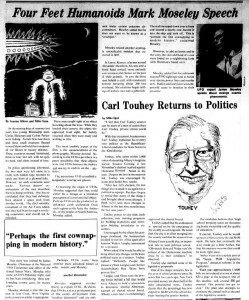 N.J.) is the best publication in the field of what’s going on or up in the airborne world. 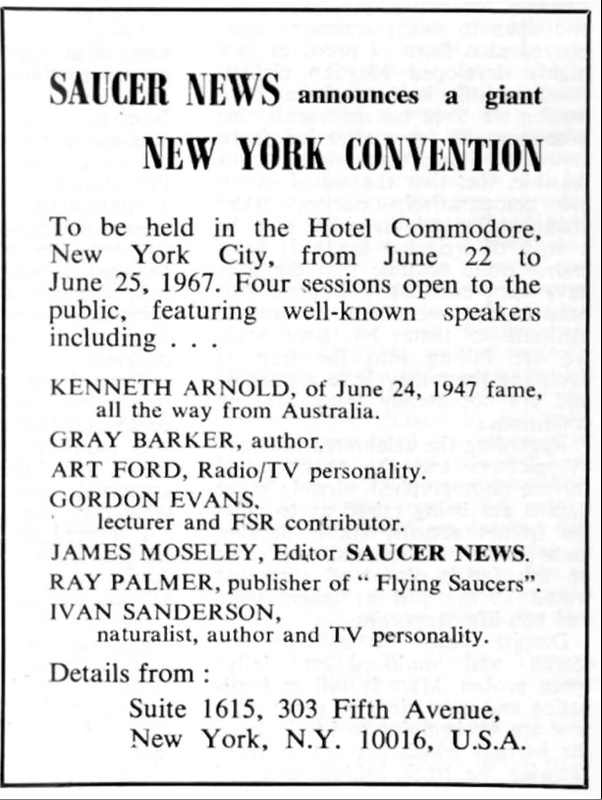 His June Ufologist convention in New York attracted more than 12.000 people. (Some New Yorkers felt that Chock Full of Nuts should have sponsored the convention). Mosely, with this pack, is more of a ringmaster than a moderator but does give a balanced lecture. 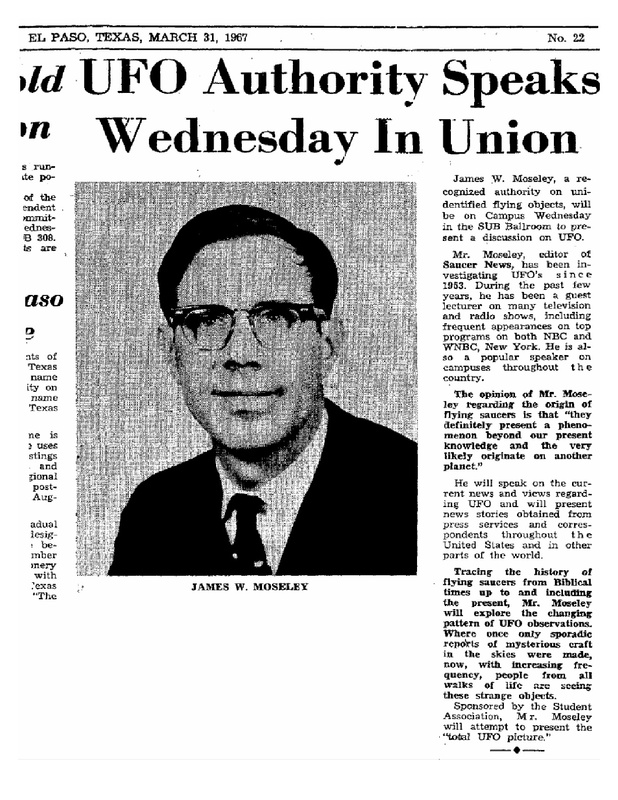 In the past six months he has spoken at the University of Delaware, Georgia Institute of Technology in Atlanta, lona College in New Rochelle, N.Y., St. Joseph’s College in Philadelphia and a large convention of General Electric engineers in Schenectady, N.Y. Anything as baffling and bewildering as UFOs is going to attract a wild and spooky element. Unhappily, the books on religion and flying saucers do little for science and nothing for religion. Most of them have been written by daydreaming fundamentalists who ride the crest of public curiosity. 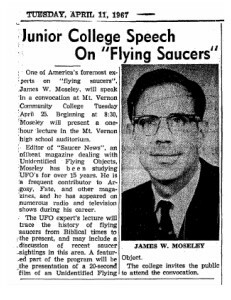 Since the Old and New Testaments have their puzzling events and confusing prophecies, they are willing to launch a flying saucer as the logical explanation of every question mark. 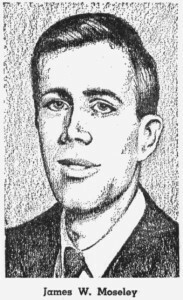 Virginia Brasington’s “Flying Saucers and the Bible.” is a good example of this absurd scholarship. Did Ezekiel have a vision of celestial glory? Of course note, she writes. He was flying around in a saucer that made him practically a commuter between the Tern pie and the desert. Is Jeremiah taken into captivity? No. he went to Ireland in the friendly skies of a flying machine. Do the Wise Men follow a star to the Christ Child in Bethlehem? Certainly not, stupid. They were in touch with a divine satellite that hedgehopped over the countryside and then stopped above the stable. These erratic writings point up a need for “space-age thinking” by our top theologians. A good assignment for any major seminary. 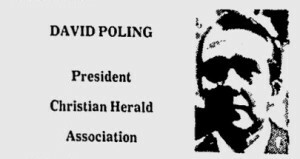 The most important result of this emphasis that is peddled in print and heard on the radio is the distraction from the meaning of Biblical truth. The heart of the scripture is not the means but the message. Ezekiel may have some weird language and Jeremiah may have an inconclusive ending but the intent is clear: Israel is to be a light shining in the dark regions of the world. Through the prophets, men were to consider the love, justice and brotherhood that God desired. A preoccupation with space ships, orbiting prophets, and divine satellites has nothing to do with the central theme of the Bible – God’s relationship with man. In fact, this pseudo-science, pseudo religion is so soaked with fraud, promotion and personal gain that it should be condemned wherever it appears. The theological discussions of saucerniks are crude and irrelevant. Here, again, the flurry has brought the fringe to the top. Review of Jim Moseley’s college lecture.